The model was built using ithink software following analysis of national cause of death data, including age and place of death. There were two engagement processes that dovetailed to produce the overall result. The first involved a wide group of between 30-40 professionals who were involved in three workshops that were used to define the issue, develop the model framework and respond to work undertaken by the consultants on an iterative basis. Between the second and third of these events a smaller engagement process was undertaken to develop detailed workforce requirements at key points on the end of life care pathway. The National End of Life Care Programme remains a coalition government priority and is the subject of the development of national tariffs for community services. This project was commissioned in this context in order to support commissioners, in partnership with local stakeholders, in understanding and securing an appropriate and needs led service response to the end of life care needs of their local population. The final tool has been developed both as a generic framework tool, available on the National End of Life Care Intelligence Network website, and as having the potential to support local strategy and implementation for end of life care services. 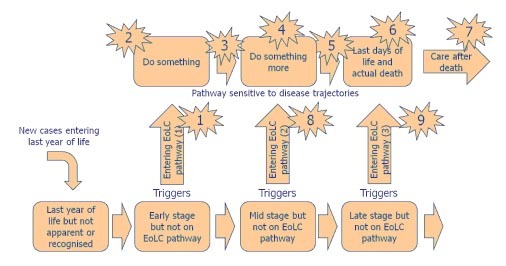 A full report on the EoLC Framework Modelling Tool is available on request from Peter Lacey .